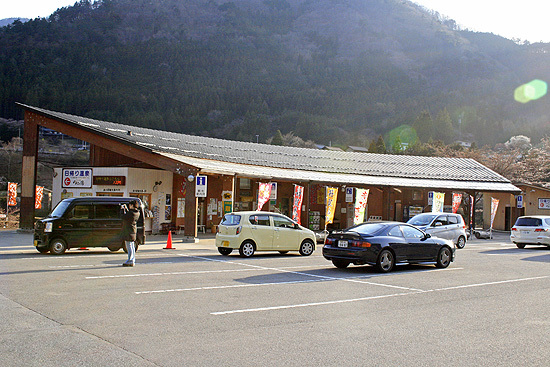 Oume – Okutama – Tabayama – Daibosatsu Mountain Pass – Isawa Onsen spa. This would be a bit difficult driving course with many sharp curves through the mountains on the way but we strongly recommend it to you because it definitely is one of the driving courses we like the best within 2 Hours Drive From Tokyo. If you prefer an easy and fast driving way we advice you to take Chuo EXPRESSWAY, which takes you only about an hour. However you will definitely miss many beautiful moments. 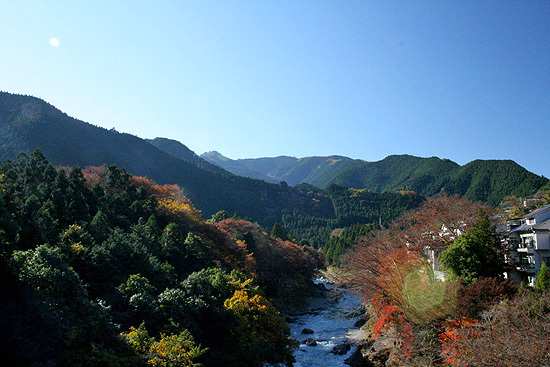 Beautiful mountainous scenery of Okutama in autumn. Rich water runs as streams and rivers through this area. Oume (青梅) is well known with its plum trees, and there is an important park of plum trees, which we should warmly watch over the growth or re-deveopment. (If you want to know about the plum trees of Oume, please refer to the past article, Ume-no-koen. 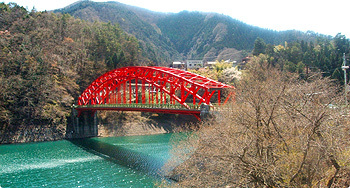 One of the bridge across the lake of Okutama. Photo from ‘Tchikawa Online‘. Okutama is a sacred part of Tokyo, where the beauty of nature is still preserved as it is, where you can enjoy fishing and camping. Mt. Mitake (御岳山) is a recommendable mountain not so high for fun mountain climbing as well as famous Mt. 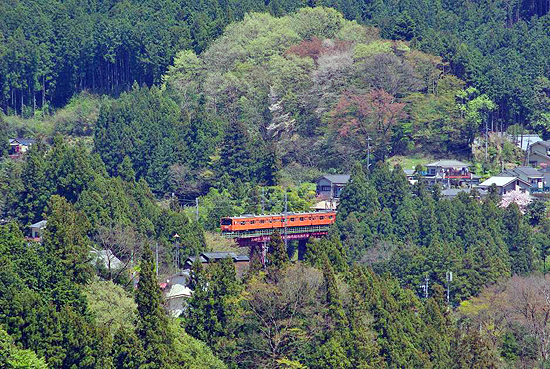 Takao (高尾山). 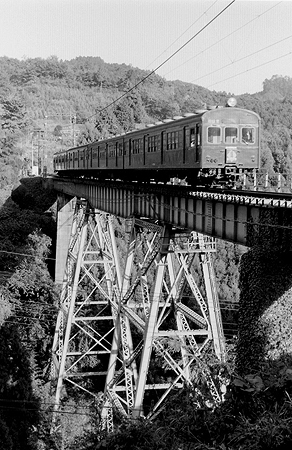 Oume Line running through the bridge high above the valley in 1970’s. Precious photo from ‘Tsunepyon-no “Toritetsu Jinsei”‘. You can find many precious photos of 1970’s Japan in his blog!! Worth looking! Of course, you can reach this area with train, Ōme LineW. It is connected with Chūō Line at Tachikawa station, an easy access from Shinjuku. You will need to go on a bus, Nishi Tokyo Bus, to get to Tabayama area from JR Oume Line, Okutama Station, for about an hour. There’s only 4 buses going and returning between Okutama and Tabayama area so be sure to check before taking busses. 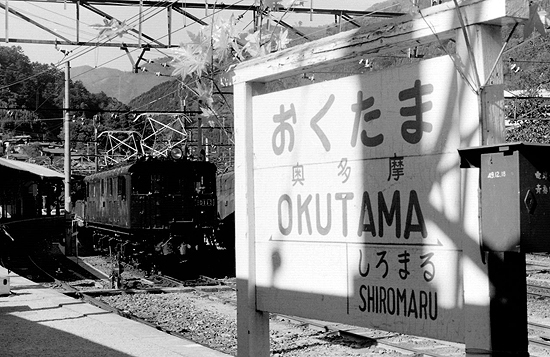 Okutama Station in 1970’s. Photo from ‘Tsunepyon-no “Toritetsu Jinsei”‘. 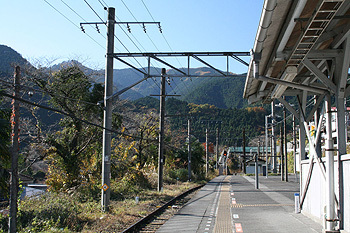 Mitake Station, for Mt.Mitake climbing, one of the station in Okutama area now. Oume Line trunning through Okutama area now. You can see how much the area is rich in nature! You may be feeling normal with the train running in the range of mountains but don’t forget…. You are still in Tokyo! If you have brought your international driver’s license with you and are well accustomed to driving on the left, we would strongly recommend you to drive the National Road 411. There runs Ōme Line on your right. There will be a magnificent view of lake Okutama on your left. Keep driving along the lake side. This driving course is especially recommended for those who love nature and if your are lucky enough, you will find wild animals such as deers and monkeys happen to come near the road! Cherry blossom which seem to be like ‘Yoko’, meaning sunlight. Taken in Michi-no-Eki Tabayama on 11th April 2014. The recommended seasons are in spring, summer and autumn. 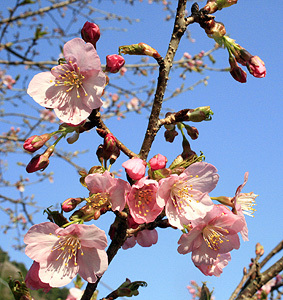 In spring, you will see many flowers in bloom such as eye-catchy plum, cherry and peach as well as other flowering plants wild and domesticated. In summer, cool and refreshing tempreture with breeze in the high mountains is very recommendable to those who want to run away from the incredible heat in big cities. In autumn, need less to say, the magnificent view of mountains with various colours decorated with autumn leaves. If you are willing to drive as we recommend, it will be a good idea for you to take a rest at Michi-no-Eki ‘TABAYAMA’ which will be on your left. Drive down the slope that should be on your left where the sign board should be. Park your car and take a relaxing moment, even taking a bath! 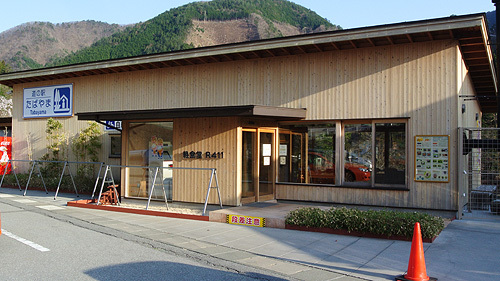 Like other Michi-no-Eki, there is a shop where they sell locally-grown vegetables and agricultural products. The characteristics of Michi-no-Eki TABAYAMA would be venison. In this area there are many deers living and since they have no natural enemies here, the numbers of deers increased too much which became the cause of serious problems to the farmers because their crops are spoiled and eaten. This sort of problem became serious because of the career changes within these 50 years. Those who engaged in occupation concerning nature like forestry and hunters drastically decreased because of the cheap lumber, meat and leather goods’ import increase. While woodcutters and hunters flourished in the nature, mountains were managed, considering the balance of wild life and human living. It was because of the economic growth that made many of these wild professionals close their business though it may have enriched their material daily living…. Small eat-in restaurant where you can taste the venison sausages as well as other simple food as ‘Japanese curry rice’. Nice view of the river running down under the building. Many mountains run too wild after decrease of woodcutters and hunters year by year. It seems as though the nature returned as it should have been in the ancient days but where wild balance was kept under natural enemies as wolves to wild animals as deers in Japan, without the Japanese wolves, now extinct species, the balance is collapsing, which influences not only to human beings but to the natural environment as well. Suspention bridge across the river to the spa site. In order to maintain the number of deers appropriate, the local hunters now still left hunt deers, make many products out from venison. The sales would be used for the maintenance and the promotions of the town as well as the nature that they hold. This is their way of coexistence in this area. Don’t worry. They love animals and they never over hunt. We love animals. We love to find wild animals. But we agree to the idea of the people in this zone as one of the methods of coexisting. You can buy some venison used products such as curries and sausages. You could try them at their restaurant. WASABI : Worldwide famous green horse radish of Japan which gives a strong and acrid flavor to your sashimi (raw fish) or Sushi. In your country you could be accustomed to an ready-pasted Wasabi but if you try fresh Wasabi, you will notice the difference is big. But don’t bite it. You ought tio grate it, right before the use. It is said that the shark skin stretched grater is appropriate to grate Wasabi! KONNYAKU : A very unique jelly-like food made from KonjakW flour made into paste to set. Omatsu-hiki is a very traditional local New Year event in which people pray for the health, happiness and the fertility of families throughout a year, which you will never be able to see in other areas. A hundred of people pull a sledge with bamboos and pine trees piled up decorated in New Year decorations and ornaments which parades to the shrine. A very traditional local event which has a 300-year history. Normally in Japan, SHISHIMAI (Lion danceW) is performed as an New Year event but here, they perform it in summer. 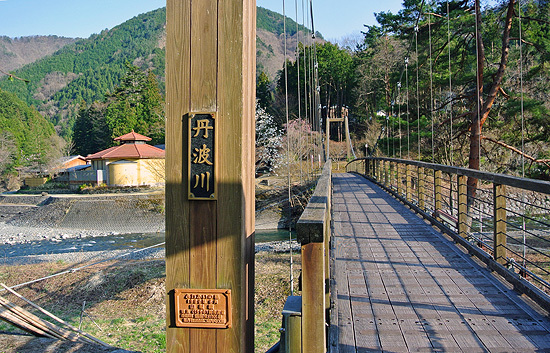 Crossing a small wooden suspention bridge over the river that runs behind the building of Michi-no-Eki TABAYAMA, you will find a building that suits the nature which is a spa, Nomekoi-yu, Nomekoi hot springs. ot spring powder like the bath salts or soda containing the indredients of the spa good for your skin and relaxation for you to enjoy the spa also at home. Simply, put the powder in your bathtub while you put hot water in your home. 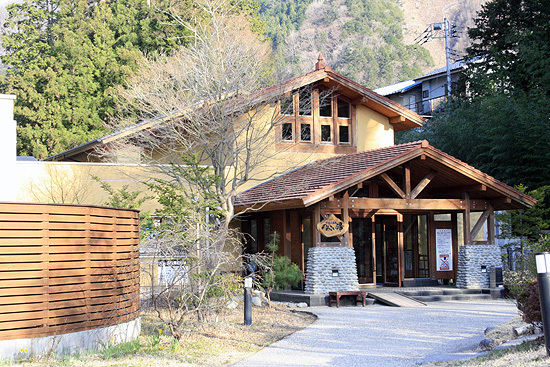 Nomekoi-Yu where you could enjoy open air bath tub spa in nature as well as indoors! 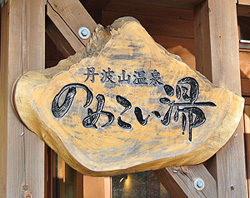 Address : 2901 Tabayama-Mura, Kita-tsuru-gun, YAMANASHI Pref.